Do you feel like your teen tunes you out—or just plain ignores you—any time you make a request or try to have a real conversation? If you’re feeling this way, it’s probably not your imagination. This is a weapon adolescents have in their arsenal, and many use it to manipulate their parents passive-aggressively. Keep in mind that it’s not always intentional. Some kids are easily distracted or can only focus on one thing at a time—they really can’t communicate while concentrating on something else. But many kids ignore their parents to manipulate them. Instead of “acting out” they’re “acting in.” They might be angry or want you to leave them alone. Instead of yelling, “Stop bothering me!” they simply tune you out. The question is, what can you do about it? It’s also important to remember that tuning parents out—as annoying as it is for us—is part of growing up. (This doesn’t mean you should always put up with it, however. More on this later.) As your child goes through different ages and stages, you’ll find that you get different responses from him. Perhaps when your child was eight or nine, he enjoyed talking with you about everything. Your teen, on the other hand, probably doesn’t want to talk to you so much. He’s still figuring out who he is and is likely becoming more private. As parents it’s important to respect that. 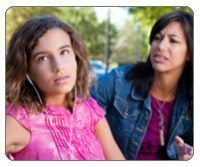 I want to start by giving you some general guidelines on what to do any time your child or teen is ignoring you, regardless of whether or not he or she is doing it on purpose. In the next part of the article, I’ll give you specific, concrete steps to deal with a child or teen who is tuning you out intentionally. 1. Remove distractions: When you really want to talk with your child, stop all distractions and outside stimuli. Here’s a tip: Ask your child to turn off the TV, cell phone or computer. It’s important to have him do it rather than just shutting off the TV yourself. Why? It becomes an active lesson for him about how to best pay attention. This is especially important if your child has a hard time focusing or concentrating, because this is a skill he will need his whole life. Bottom line: When you want to have a conversation, reduce stimulation. 2. Be clear and keep your tone neutral. Tell your child that you want to have a conversation. Be very clear about what you want to say; don’t be too wordy. Try to limit the information you want to get across because if you don’t, your child is not going to be able to absorb it all. It can be hard for kids to really sit down and have a conversation with parents. We often talk too much and make things too complicated because we’re adults and that’s how we think and talk. Kids are often unable to express themselves well, so they may appear not to be communicating cooperatively because they’re not saying much—but in actuality, they may not know how to articulate what they want to say. It’s also important to have a very matter of fact tone of voice. Sometimes your child will take in your tone and the look on your face even more than your words. 3. Don’t use words that shut down the conversation. It’s also important to be aware of conversational “triggers”—words you use that may trigger your child to shut down. When my own son was a teen, I used to start conversations with him by saying, “I want to talk to you.” But what he heard was, “You’re in trouble.” When I realized it was a trigger for him that actually shut down communication, I knew I had to find a different way to start discussions. I changed my approach and started saying things like, “I was thinking about you and had some thoughts I wanted to share with you.” This worked well because it invited a discussion instead of shutting it down. Another way to more openly communicate with your child would be to say, “Maybe we could have some alone time, just the two of us, and discuss how things are going over breakfast.” Try not to use words that you always use when you’re angry. Changing your tone of voice might also help make your child less defensive. Remember, you want to set the stage for more open communication. 4. Set the stage for a more open discussion. Decide when you want to have that conversation with your child. Choose the time you want to talk to your child—don’t always let the time choose you. Before you do, find a quiet, private place and make sure outside stimuli are shut down. Believe it or not, sometimes your child really doesn’t hear you. He really can only focus on one thing at a time. Car rides are often a great place to have conversations with our kids—it’s soothing, and it gives them a sense of space which might help them deal with more difficult subjects. It also provides a change of scenery. You could also take your child to a place where grown-ups have conversations, like a coffee shop or a restaurant. I’ve found this works very well, especially if you need to have more of a grown-up conversation. 5. Don’t expect a long conversation. Don’t expect a lot back from your child, especially if you happen to have a quiet kid. When my son was a teen, there was no way he was going to have a paragraph response to anything we said—even if it was important. So really know your child and how verbal he or she is, and don’t expect more than they can give. 7. Play it back. Ask your child to “play back” to you what they’ve heard. You could say, for example, “What do you think I’m saying?” Or “What did you hear me say? I need to hear it in your own words. Any comments, any responses?” (Be sure to say this in a neutral, matter of fact way.) If they can repeat what you’ve said, you’ll know if they’ve heard it correctly. 8. Setting limits when kids won’t listen. Let’s say the conversation is about studying and it’s a chronic problem. You’ve given your child some recommendations but she’s still missing some assignments, failing to study for tests and doing poorly. You might say, “If you’re not open to suggestions and doing things differently, I’ll need to get more involved and talk with your teacher about this. I will meet with her and come up with a plan for you.” This is one way to let your child know that you mean business. You’re not going to just let it go because your child doesn’t want to listen; you’re going to take some action. You also may choose to put limits around computer use, the cell phone and free time, because your child needs those external limits to study better. So remember, when you decide to set limits, it goes from a conversation to an action. What should you do when your child is ignoring you on purpose? Let’s say your 13-year-old is sitting in the living room texting a friend. You need to talk to her about her disrespectful, rude outburst in the kitchen an hour before. First, have her turn off the electronics. If she still ignores you or won’t engage in conversation, tell her to go to her room. You can say, “When you’re ready to talk, come down.” Take the cell phone, computer, iPod and other distractions out of her room, by the way—make sure she doesn’t have too much to do in there. Eventually, if kids can’t do anything else, they will likely talk to you. Instead of leaving it up to the child to come and talk, some parents might prefer to go up and check in on the child from time to time instead. It depends on the parent and the kid—but regardless, make sure your son or daughter is calm and ready to talk when you finally sit down. One note: If this happens around a mealtime, your child can come and eat. Be matter of fact, give them their meal, and then send them back to their room afterward. Again, they need to be calm and able to listen. Remember to keep a neutral tone. Defiant kids will try to pull you in. If your child starts to escalate or shuts you out again, you can say, “Okay, I guess you weren’t ready to talk yet. Go back to your room until you are.” Don’t ask, “Why are you so angry?” “Why” questions don’t take you anywhere, because they are blaming questions—it sounds like you are blaming your child for something right off the bat. Starting with why often ends in an argument. Again, be calm and be explicit about what you observed. If your child has been disrespectful, you can say, “That behavior is not acceptable. It’s okay to be angry, but rude, disrespectful behavior is not okay.” (Let her know what the consequences will be if she has crossed the line by swearing or name-calling.) As difficult as it is, try to remain calm and matter of fact during the entire conversation. Believe me, I understand that this isn’t easy—but the rewards are well worth it. What you’re trying to do is build the opportunity to have an open discussion with your child and help her gain insight. You want her to learn better problem-solving skills that she’ll be able to use when she’s an adult. Remember, communication takes time. The end goal is that your child will be able to look at herself honestly, take responsibility for her actions, and learn how to communicate with people in a healthy way.